Central Nagasaki - don't port cities always look nice at dusk? Nagasaki is one of those sleepy little cities whose location got it shaken awake by the course of history more often that it should have. Sitting there at the mouth of a harbor on the far western edge of Japan, you could imagine it looking the same as some far-flung outpost at the edge of the world, like a Hobart or St John’s. But Nagasaki is not at the edge of the world, rather right in the thick of things, and since it got everyone’s attention it’s been through a lot. More recently, history has left Nagasaki in peace once more and the population is around half a million. 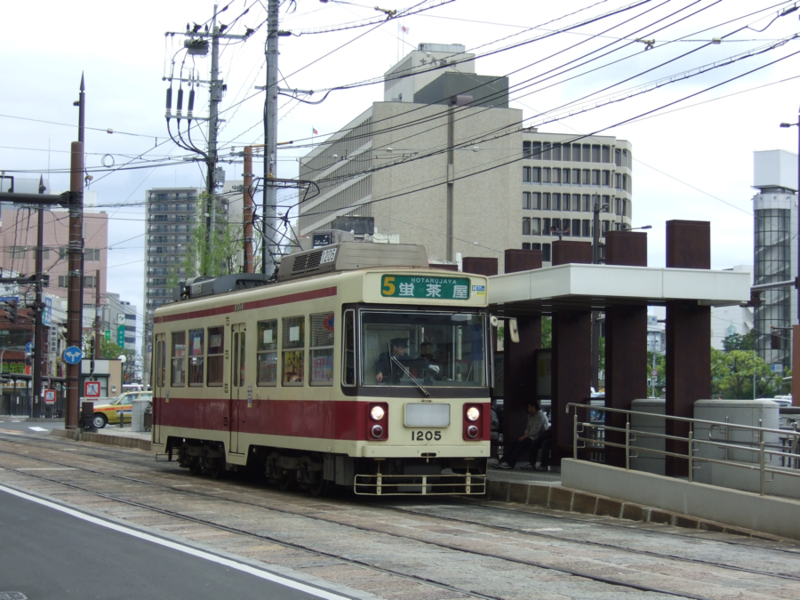 Most Japanese visited as junior high school students and then forgot all about it. Non-Japanese think of it wrongly as a giant peace memorial. The coal mines shut down years ago and there isn’t much traffic on the roads. Maybe it only feels sleepy compared to Tokyo, because it’s energetic enough around the port and there’s still a lot of industrial activity in the form of shipping and giant Mitsubishi plants. 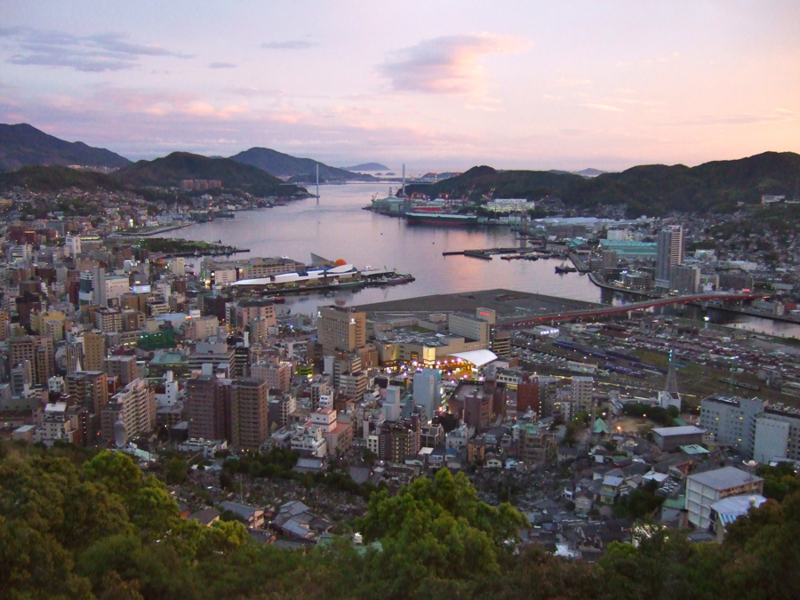 The first thing you notice about Nagasaki is that it’s very hilly. The sun rises late and sets early between the walls of the Urakami Valley and they’re not that far from the city center. They’re steep, too. Head about five minutes right or left and already you can catch some impressive views from between apartment blocks perched on stilts in ways that make flat-land dwellers nervous. The skyline isn’t impressive but it doesn’t need to be, since it’s one of those you look down upon instead of admiring from a distance. You can get around all the interesting places on the streetcar network. I’m a tram lover and bus hater (dear god I hate buses), so it was great to see a working commuter light rail with funky old vehicles rattling around. Something I wasn’t expecting was the cute river with a whole series of stone bridges, winding through the central city. Each one of these bridges has significance but they’re a collective landmark. As with many structures in Japan they’ve all been destroyed and rebuilt over the years, these ones in large floods. Most of the time though, the river is a peaceful little trickle and perfect for a stroll. 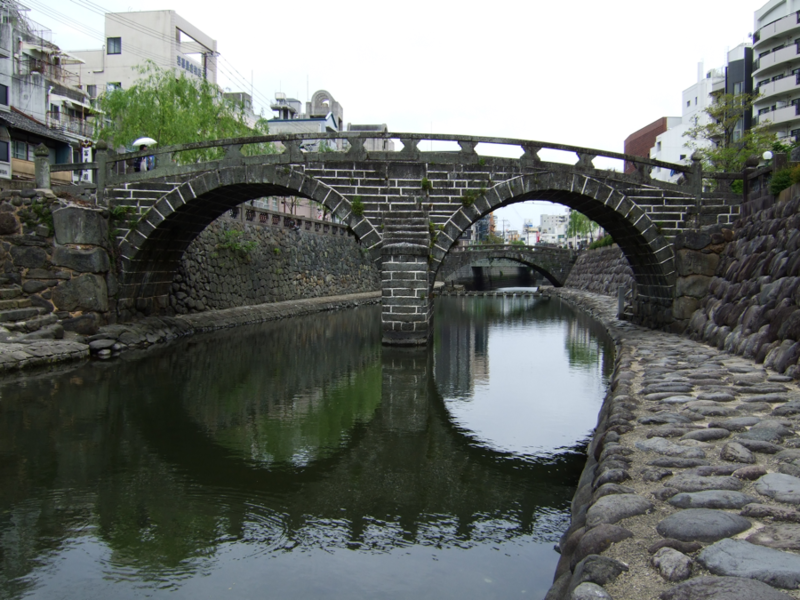 The most well known bridge is Megane-bashi (‘eyeglasses bridge’) with its twin arches making it look like a big stone pair of spectacles when the water’s calm. You might miss it otherwise, but it’s the one with all the photographers trying each angle to get the money shot. 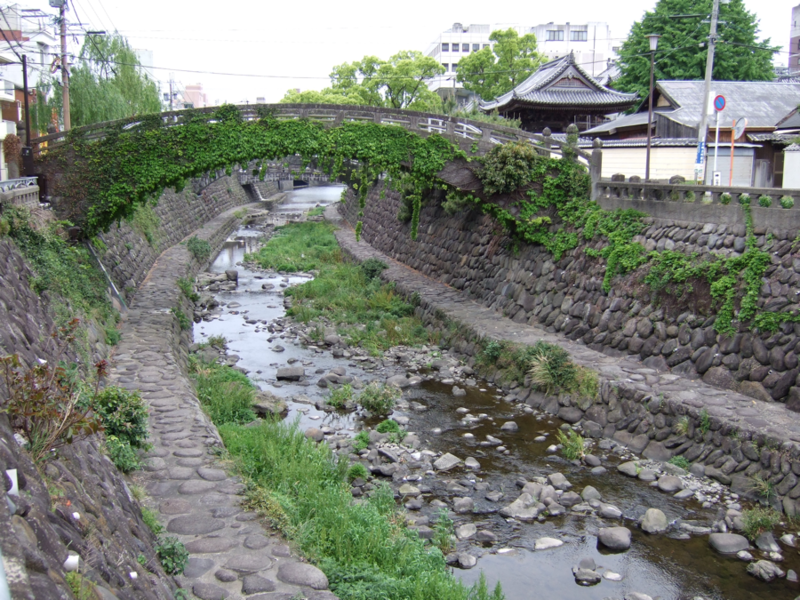 Megane-bashi, or 'eyeglasses bridge' - see why? I’d better explain some of Nagasaki’s history, since it’s impossible to recognize or find the attractions without knowing the basics. In short, it all began in the mid 16th century when some Portuguese explorers found it and soon turned it into a trading post for all the things nations traded before the Industrial Revolution, like fabrics and tobacco and each other’s local cuisine. That’s where the sponge cake comes in. Wherever you go in Nagasaki you’ll see shelves full of cake squares called castella, sponge cake-themed kids’ characters and key rings in a display that makes you wonder if Nagasaki realizes sponge cake is common around the world. It’s another leftover from the Portuguese and actually tastes pretty good. They’ve refined it an a way only the Japanese can, reducing cake to its zen essence and mass-producing it at excellent quality with the option of green tea flavor. Any visit to Nagasaki will surely involve castella—even if you’re not into cakes, you’ll get so sick of seeing it advertised everywhere you’ll probably let them have their way with you. 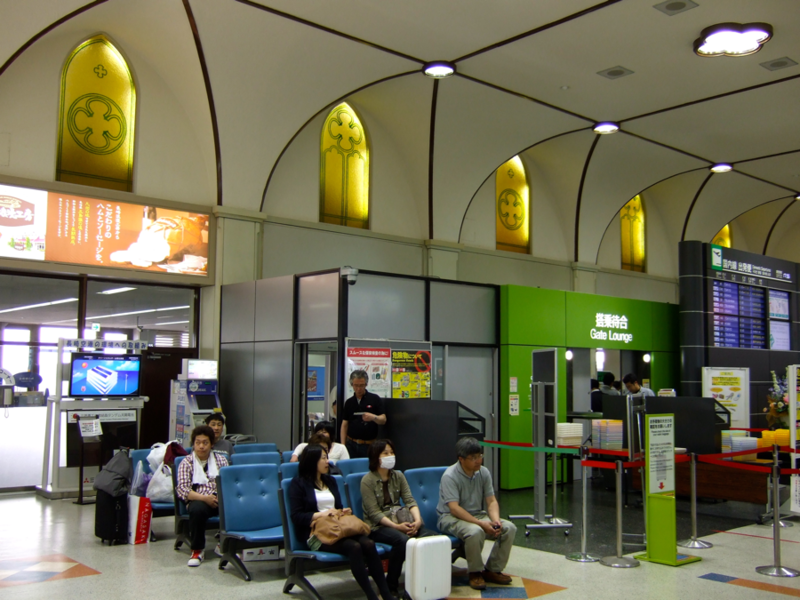 Back to the 1500s: the Christian missionaries became so successful they ended up running the town, and Nagasaki became an island of Catholic bliss in Japan at a time when Christianity was illegal in other parts of the country. Such blatant foreign-ness was tolerated and disapproved of in varying degrees until Toyotomi Hideyoshi finally put his foot down, wanting to unify Japan and remove the Christians before they completely took over, after seeing them do just that in the Philippines. His tactic was spectacular and gruesome, with 26 Christians (including seven foreigners and three young boys) lined up on a hill, crucified on crosses, and run through with spears. What Toyotomi failed to realize, though, was that crucifixion has a poor track record of getting rid of Christians. And as they’d done in the Roman Empire, they went underground until the mood became more favorable, rebounding the instant their religion was legalized and turning Nagasaki into a city of churches and cathedrals. 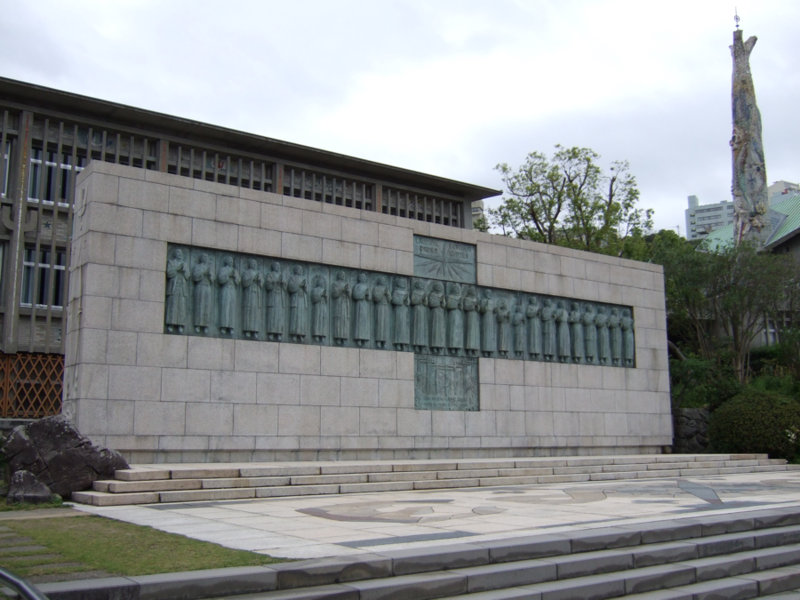 Pope Pius IX canonized the ’26 Martyrs of Japan’ as saints in 1862 and the site of their death is a stop on the pilgrim trail. There is, of course, a monument. For an East Asian city Nagasaki has a surprising number of steeples, and not the red neon kind you see across Seoul. It’s probably the only place in Japan I’ve seen more old churches than Buddhist temples or Shinto Shrines.